Put into a large china bowl a good handful of sugar in lumps, over which pour half a bottle of sherry, Madeira, or other good white wine, a glass of brandy, and half a bottle of old cider. When the sugar is dissolved, take it to a cow warranted not to kick, and have the cow milked into the bowl, so that the froth shall rise in a heap over its contents. Milk it as full as it will hold without running over. Set it on a table, and grate a little nutmeg over the top of the froth. Then put it aside in a cool place for a few hours; if all night, so much the better. N.B. Try to get your syllabub made at one of the cow's milking times. Let her be half milked into the pail, and then present your bowl to receive what comes afterwards. 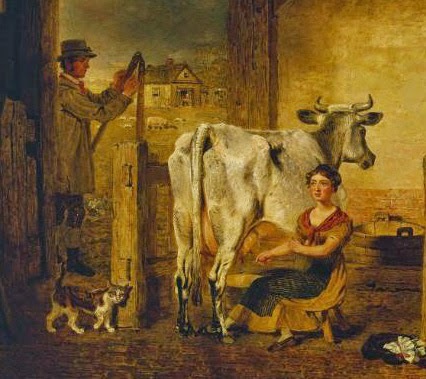 The last milk from the udder is the richest; the very last, called "the strippings," is the richest of all. Syllabub under the Cow, without a Cow. Fill a large teapot with fresh, tepid milk, with which you may mix a little cream. Set the bowl, with the wine, &C., on the floor. Mount the highest stool or table in the house, and from that eminence pour the milk out of the teapot into the bowl, frothing it as much, and spilling it as little, as possible. You will succeed even better (in the unavoidable absence of the cow), by putting the warm milk into a large, powerful syringe, and so squirting it violently into the bowl. Where there's a will, there's a way, even to make sub-vaccine syllabub. The French kitchen vocabulary contains no word for syllabub. Put a bottle of strong beer and a pint of cider into a punch bowl, grate in a small nutmeg, and sweeten it to your taste; then milk as much milk from the cow as will make a strong froth, and the ale look clear, let it stand an hour, and strew over it a few currants, well washed, picked, and plumped before the fire, and send it to the table. oh Pat!!! I love it! Someday I will have my own milk cow and I will try this recipe and report back! Thanks for sharing. Great!! Do tell me what it is like. Hey, that reason alone is why you need to get a cow!